Actuator is an integral part of the electric controlled automotive systems and is also applied in some mechanical systems. The prime function of the actuator is to convert the signals of different form into mechanical action. The input signals is likely to be in different forms, it may be mechanical, electrical, pneumatic, or hydraulic. The actuator market for automotive is expected to expand at a CAGR of 6.5% during the forecast period. The global actuator market for automotive is expanding due to the entailment of the automatic and electric features in the vehicles. All the automatic systems in the vehicle consists of actuators, which runs on the basis of the input provided by the sensor. Subsequently, the introduction of automatic systems in vehicles is anticipated to boost the demand for actuators. Rising trend of automatic systems and engine downsizing is boosting the actuator market for automotive. Earlier, the vehicles had the manual door lock and window lock features; however most vehicles, presently, have automated door lock and window lock systems, which indicates the high rate of adoption of automatic systems in vehicles. Stringent emission norms is a major factor that is prompting manufacturers to downsize the engine. Some performance boosters are installed, which require actuators for their proper functioning, in order to maintain the performance of the vehicle after engine downsizing. Introduction of the autonomous vehicle is also likely to boost the demand for actuators in vehicles, as every system of these vehicles is expected to run automatically. 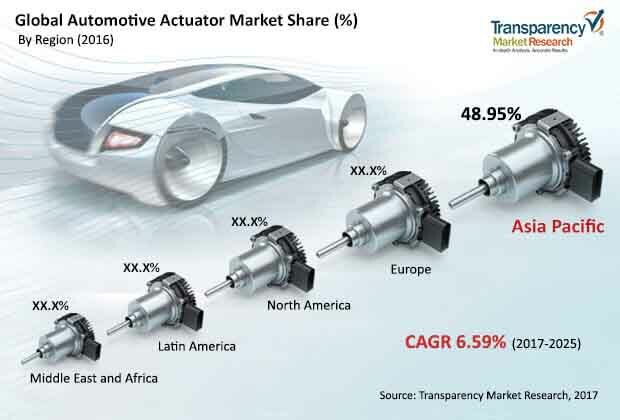 The actuator market for automotive is likely to be hampered due to the introduction of electric vehicles, as some actuators accompanied with the engine are expected to be removed from the drive train. Electric vehicles are likely to run completely on servo motors. Government of several nations are encouraging the introduction of electric vehicles in order to lower pollution levels. Governments are also offering monetary benefits to encourage society to adopt electric vehicles. Actuator manufacturers are likely to witness growth opportunities in order to provide actuators for electric vehicles, as the demand of the electric vehicle is expected to increase during the forecast period. Most actuators other than the drivetrain actuators are expected to remain the same even for the electric vehicles with minor changes, due to availability of power in different form and range. In terms of application, the adaptive headlamp segment is expected to expand at a rapid pace due to the increasing concern among society toward safety. Adaptive headlamps are provided in several late models and is expected to be installed in most vehicles. However, The HVAC system is the most promising segment and holds a major share of the automotive actuator market. The segment holds a major share due to its installation in most vehicles. Furthermore, the HVAC system requires multiple actuators, which boost the share held by the segment, as compared to other actuators, in terms of volume. Asia Pacific is a major market for automotive actuators due to the significant production of vehicles in the region. Asia Pacific is the center of attraction for the manufacturers due to availability of resources at lower cost. High sales of the vehicles owing to increasing disposable income of society has always been a major factor for investment by large manufacturers in the region. According to OICA, Asia Pacific registered the maximum number of vehicles across the globe in 2017, which indicates the high consumption rate of the vehicles in the region. The actuator market for automotive witnesses the presence of major players and small players. Key players such as Hitachi Ltd, HELLA GmbH & Co. KGaA, Johnson Electric, Mitsubishi Electric Corporation, Robert Bosch GmbH, and Valeo hold a major share of the market. Robert Bosch GmbH is a prominent player and holds a major share of the actuator market for automotive. The company focuses on joint ventures for its expansion and growth. Johnson Electric is another major manufacturer of actuators for vehicles and has specialization in manufacturing of sensors and actuators for vehicles. Johnson Electric holds a prominent position in the actuator market for automotive, despite of holding a small share as compared to other major manufacturers.